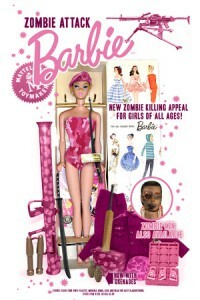 Moe Lane » Zombie Attack Barbie! The accessories. You do not take down zombies with a bazooka. You do not take down zombies with grenades. And you DO. NOT. ISSUE. ANTI. ZOMBIE. BODY. ARMOR. THAT. DOES. NOT. HAVE. ADEQUATE. NECK. AND. FACIAL. PROTECTION. The rifle is fine, but a .22 Olympic target pistol is arguably better for head shots; and while both melee weapons are very reasonable choices I would personally argue in favor of a good boar spear with crossbar. On the other hand, the pink is a very good call. After all, color camouflage is very rarely necessary when facing a zombie and being able to identify equipment quickly can be a lifesaver. And, yes, well, it is awesome overall. PS: Just in case the artist ever reads this: I liked the project. And I know that they don’t really make plastic accessory boar spears. Still. Maybe a chainmail coif, next time? She looks like she would get along fabulously with Juliet from Lollipop Chainsaw. The advantage to the bright pink is that other survivors have an easier time identifying you as one of the living. Moe, the boar spear is nice but strikes me as unwieldy. Would not want it as my only weapon in say a building hallway. Now, in the open and mounted on horseback? Awesome choice. Why a Katanna, your going to want a thrusting sword like the Rapier or Broadsword, a katanna is only good for lower head or across the eyes slices it’s a poor thrusting weapon. You are going to want to hit the Brain. Catseye: thrusting weapons can get stuck, though. Also: skulls are, after all, pretty much designed to keep things from hitting the brain. It’s largely conceded that a katana is an excellent decapitation weapon, given its sharpness; and turning a zombie into a zombie head while engaging multiple Undead is a recognized, if disputed by some, tactic. But a rapier is not a bad choice, if you have the skill level for it. I might argue a bayoneted rifle, though. It’s a little heavy and not ideal for confined spaces, but you can’t go wrong with a good halbard. Given the strength of the skull and the mad scramble of the typical zomibe attack, I really can’t recommend a weapon that relies on high precision. Jinx: hey, I love the halberd. It’s the Swiss Army knife of pole-arms and almost seems evolved into a squad zombie cleanup weapon. I agree with Moe. If I had only a choice of swords during a zombie attack, I would choose a Katanna. Duct tape a shark to the end of a long pole and it’ll bite the zombie heads off for you. Cuz hey, for the shark it’s an easy peasy human head buffet. There are some Chinese polearms that are also worth while for consideration, they almost look like they were designed for dealing with zombies. And I know to avoid the cheekbones and browridge when thrusting to the head. I also agree with the bayoneted rifle idea. Decapitation in melee strikes me as a way to cause more problems for yourself you have to keep track of the heads to avoid stepping on them or tripping, not to mention ankle bites. Catseye, anybody who won’t wear good boots to a zombie sanitation exercise as a matter of course is a person that is merely looking for an exotic form of suicide.